Step 1 In a large saucepan, combine the milk, cream, one-half cup of the sugar and the vanilla paste (not extract, if using) and bring to a boil, stirring to dissolve the sugar. Remove from the heat and if using vanilla extract, stir that in. Step 2 Toast the slices under a broiler on a baking sheet or in a toaster until both sides are golden-brown. Step 3In a large bowl, lightly whisk the eggs. Whisk in the remaining one-half cup sugar. Whisk several ladles of the milk mixture into the yolk mixture, then whisk the yolk mixture back into the milk. Strain through a fine-mesh basket strainer into a bowl and cool the custard, or chill over an ice bath to room temperature. Step 4Spread about one-fourth inch of the custard in the bottom of a 9-by-13-inch baking pan. Step 5In a separate baking dish, place 2 slices of the bread and pour in enough of the egg mixture to cover. Soak them, turning once, for about 1 minute; do not soak too long, or they will be difficult to move. Carefully place the slices of bread crosswise in the baking pan. Repeat with two more slices so that you have one full layer of soaked bread in the bottom of the baking pan. Step 6Cut the bananas in half crosswise, then cut each half lengthwise into 3 slices. Place the banana slices side by side, running lengthwise in the pan, to cover the bread. Soak the remaining 4 pieces of bread in 2 batches and lay them over the bananas. Pour the remaining egg mixture over the top. Step 7Cover the bread pudding with a piece of plastic wrap and press down gently. Set aside for 20 minutes to allow the egg mixture to soak into the bread. Step 8Heat the oven to 300 degrees. Bring a large saucepan of water to a simmer. Remove the plastic wrap and place a piece of parchment paper over the top of the bread pudding. Cover the pan with aluminum foil. Step 9Put the baking pan in a larger pan, such as a roasting pan. Carefully pour enough hot water into the roasting pan to come about two-thirds up the sides of the baking pan. Bake until an instant-read thermometer inserted in the center of the pudding reaches 180 degrees (a knife inserted in the pudding should come out clean), up to about 2 hours, checking after the first hour. Carefully remove the baking pan from the water bath (using a turkey baster or ladle to remove some of the water from the roasting pan first will make this easier), set on a rack and cool, still covered, to room temperature. Refrigerate for at least 6 hours; it will keep up to 2 days. Step 1 0Cut the bread pudding into 24 pieces and remove as many as desired from the pan. Trim them as necessary and scrape off any custard from the bottom of the squares. In Recipes-list.com we have selected the most viewed recipes from category - Desserts . Enjoy the best recipes specially selected for you! 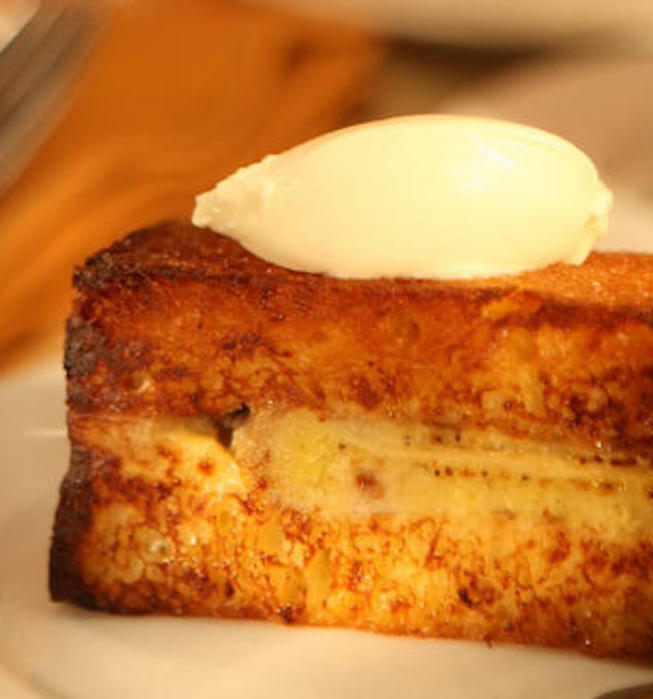 Banana bread pudding is the right choice that will satisfy all your claims.